Great niece D Watson recounted that when George Bruce Cliff was born on 14 October 1893 in Winchester, Canterbury, his father, George, was 63 and his mother, Mary Violetta, was 26. On 12 December 1914 George joined the Army. He was wounded in right leg on 27 August 1915, while serving in the Dardanelles, and later was wounded again in the shoulder on 15 September 1916 in France. George served in France, Malta and Egypt. Geirge was finally discharged on 3 February 918 as no longer fit for service due to wounds. 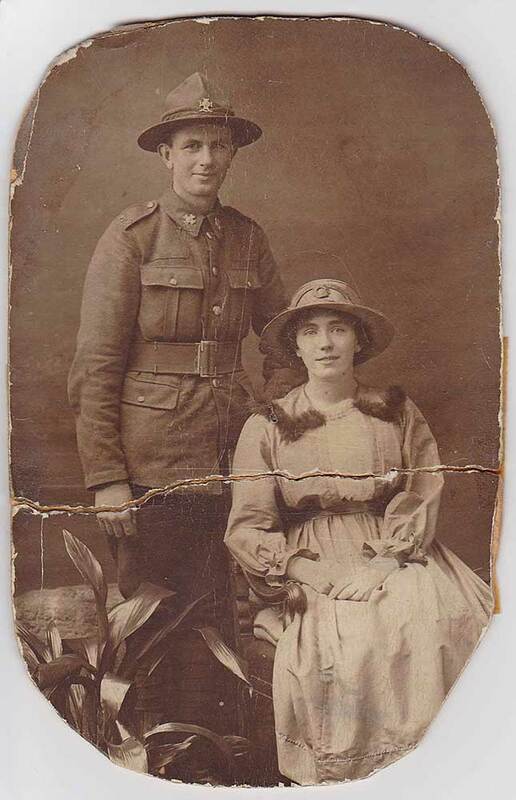 He had married Ethel Florence Carthew in December 1917, in Newton Abbot, Devon. George came back from the war to discover that the farm at Winchester had gone (the family story is that a lawyer somehow gained possession of it). This apparently left George bitter, and he moved to Masterton to begin again. Ethel and George went on to have ten children in 18 years. George died on 25 August 1965 in Masterton, Wellington, at the age of 71, and was buried there.